A recent scientific study highlights the importance of thinking critically about the kinds of reasons we use when we try to convince an audience. The kinds of examples that Willer and Feinberg focus on: if you want to convince someone with politically conservative views that some new policy initiative is a good one, you need to ground your argument in reasons that dovetail with conservative ideology — even if you don’t think those are the best reasons. There’s a cynical take on this, namely that it may be effective to argue in bad faith, by putting forward reasons that you don’t actually believe in, in order to persuade your audience. But that’s not the only way to understand the point here, and it’s not the most constructive lesson to draw from Willer and Feinberg’s experiments. Imagine you are trying to promote some plan of action, whether it’s a new government policy or a new corporate strategy or a destination for your family vacation. Now imagine you can think of 5 or 6 perfectly good reasons in favour of that course of action. You probably don’t want to launch all of those reasons at your audience — that’s probably overkill. You want to make a focused argument. But then which of those reasons will you actually put forward? The results provided by Willer and Feinberg suggest a straightforward strategy for honing your argument: make use of those premises that are most likely to dovetail with views your audience already holds. 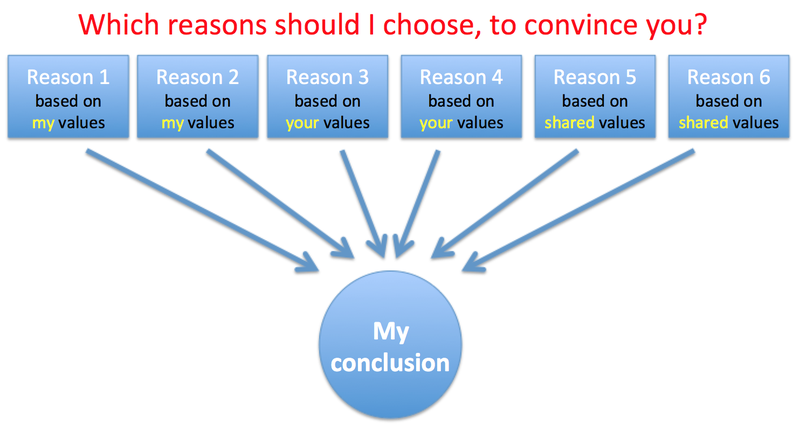 In argumentation, what matters isn’t which premises you believe are best, but which premises your audience is most likely to accept. The whole goal of argumentation is to take people from premises they accept to a conclusion that they don’t (yet) accept. Adopting controversial starting points defeats the whole purpose. A further leadership lesson flows from this: if you want to lead people, you need to understand them well enough to know what reasons for action they will find compelling. And you need to understand yourself well enough to know which reasons you will be drawn to, so that you can avoid being biased by your own preferences. You need to know yourself in order to be able to focus on others. The article focuses on political persuasion, but the focus on politics is almost entirely incidental. The key lessons here really are about persuasion in general, and about leadership. This entry was posted in Uncategorized on November 15, 2015 by Chris MacDonald.